I am a digital learning coordinator in the Katy (Texas) Independent School District, and we have a Bring Your Own Device (BYOD) policy in place. With personal mobile devices, students have an engaging, educational tool at their fingertips and are encouraged to use their device to enhance learning. Recently, in order to foster a better understanding of safe and responsible online learning, we decided to hold a Digital Citizenship Week. Our thought was that we would be able to take a whole-community approach and teach more than 60,000 students from grades K-12 important lessons about safety, responsibility, and community using Common Sense Media's resources, all in one week. Each day of Digital Citizenship Week featured a different theme, and students not only dressed the part but also participated in digital literacy and citizenship lessons, viewed and created educational videos, and discussed appropriate actions for learning and living in a digital world. The Katy ISD Digital Citizenship Committee provided all the schools in the district with a website that housed resources and activities. Each campus tailored the week's events to meet their needs and added special events, guest speakers, and arts activities to complement the provided resources. 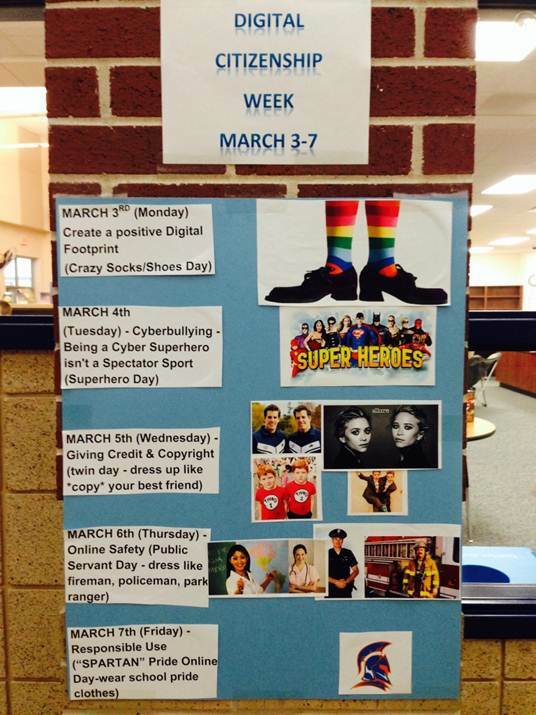 During the week, secondary students could compete in a districtwide video contest about cyberbullying. The top three videos were played for all campuses and posted on the district website. The winning videos are available for viewing here. Another campaign was titled “Text it Forward." Students could sign up for a Katy ISD group on Remind101 to receive positive and important text messages that they could then forward to friends. Remind101 is a safe tool teachers can use to text reminders to their students. The real power of educating students about their online presence happens in the daily discourse among teacher, parent, and student. Daily reminders of what to post, how to comment effectively, what dangers or scams are out there, and how to create a positive digital footprint are important messages for helping young people navigate their technology-saturated world. But in addition to these regular discussions, and the regular digital literacy and citizenships lessons that are taught to students throughout the school year, sometimes a spirited departure from the norm can bring additional focus and energy to an important topic. That's what Digital Citizenship Week did for our district. It energized our discussions around the topic, highlighted the great work our staff and students are doing, and added another layer to our evolving understanding of the changing digital landscape. BYOD: OK or No Way?